DESCRIPTION: A beautiful antique Chinese necklace strung with pink coral, turquoise and silver beads. 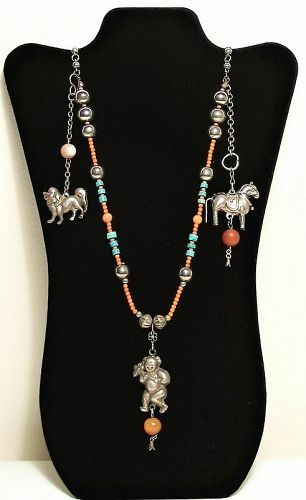 Three silver figural pendants hang from the necklace, including a foo dog, a horse with saddle and bridal, and a child holding a large flower, each with agate beads. Qing Dynasty, excellent condition. DIMENSIONS: 28.5” end to end (72.5 cm). DESCRIPTION: A beautiful antique Chinese tobacco pipe, elegantly crafted from a long bamboo stem lacquered in red and black. 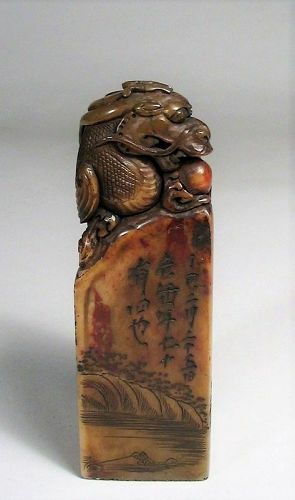 The tip (bit) is carved from a pure white nephrite jade stone that is tapered and then flared to form the lip. The bowl and shank are crafted from silver metal, and bands of brass rings decorate each end. This pipe is in excellent condition and dates from the latter Qing Dynasty. DIMENSIONS: 17 ¼” long (44 cm). 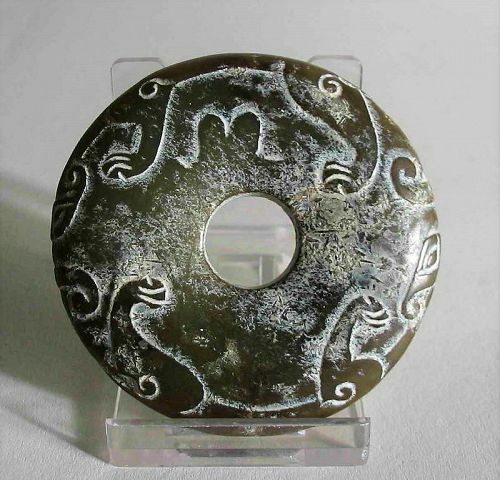 DESCRIPTION: An appealing green nephrite disk or bi, carved with two chilong dragons whose heads and bodies ring the edges with their limbs draping down on either side. From a mid-west collection, the design, color and form are quite pleasing and could be used as a toggle or an eye-catching pendant when incorporated into a necklace. DIMENSIONS: 2 5/8” diameter (6 cm), 2.25 oz. (64g) weight.